Every thought of how to Accelerated Innovation? One answer is Constraints! Constraints help innovation through one simple truth: constraints create conflict. In a Pixar Studios’ experiment for example, the constraint on personal workspace forces employees to discuss, negotiate, disagree and eventually compromise on a new, innovative solution. Indeed, innovation arises when problems are faced through a new perspective. Constraints lead to faster feedback and focus attention. They offer the opportunity to problem-solve, forcing the innovator to approach problems, not through the front door, but through a side door they found while discovering how to work with the constraints placed in their way. All in all, limitations enhance innovation. Struggling against others who have different views on an idea/project, figuring out a way to share common resources, working together to achieve shared goals and giving/receiving direct feedback all create an imaginative synergy with the power to drive creative innovation further and faster than unlimited resources, time, or freedom. BCG (Boston Consulting Group) just published its latest innovation report. According to BCG innovation is the ability to create value from new ideas, whether those ideas are new to the world or new to a particular company. As summarized by Rob Preston the report indicates 67% of the executives the consulting firm surveyed last year ranked innovation as a top three strategic priority, the highest level in the survey’s eight-year history, and 24% ranked it as number one priority. The executives are putting their money with their mouths are: 69% say their companies will increase their spending on innovation this year, the highest percentage in six years and up from 61% in 2010, the last time BCG conducted its survey. Companies in emerging markets put even more emphasis on innovation than those in developed markets: 90% of Indian executives and 89% of South American executives, for example, rank innovation as a top three priority, compared with 66% of U.S. executives. Within Europe, executives in Germany are the most bullish on innovation; execs in Italy and Spain the least. The report breaks down the 2,277 private tech companies that were acquired globally in 2012, and examining corresponding trends. 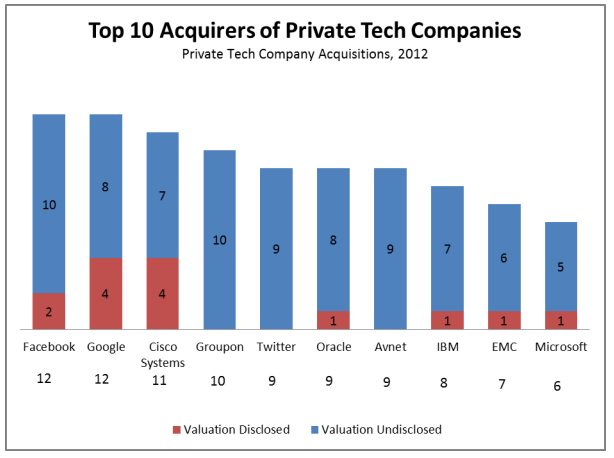 As expected California saw the most private tech companies acquisitions. Position on the top 3 markets globally suggests that India’s entrepreneurial tech community is becoming more established. 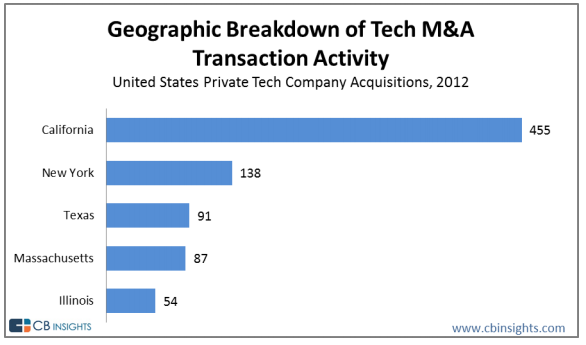 Google and Facebook have been the most aggressive acquirers last year, doing 12 acquisitions each. Five of Facebook’s acquisitions were for talents. From the companies what were acquired, eight have been valued on more than $1 billion. 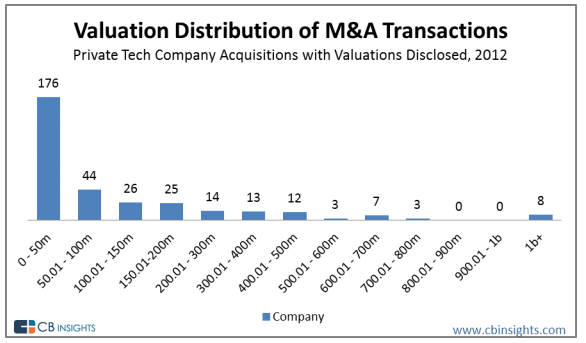 Otherwise more than 50% of deals are less than $50M and more than 80% of the acquisitions are less than $200M. “Everything that can be invented has been invented.. 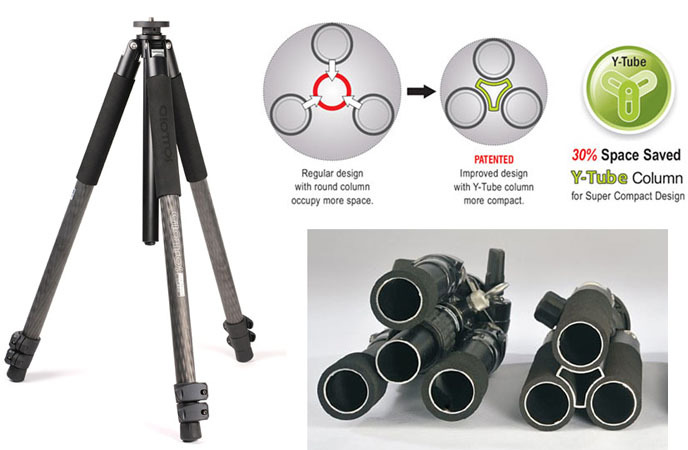 In hindsight it seems like the most obvious way to design a folding tripod’s center support column, but Giottos‘ new Silk Road series are actually the first to use a clever three-way, Y-shaped post making the whole package about 30 percent more compact when collapsed. It makes you wonder what other obvious things we are missing ..
• First: Market progress is separate from technology progress. Customers do not always know what they need. • Second: Innovation requires resource allocation which is extraordinarily difficult for disruptive technologies. • Third: Disruptive technology needs a new market. Old customers are less relevant. Disruptive technology is a marketing problem, not a technological one. • Fourth: Organizations have narrow capabilities. New markets enabled by disruptive technologies require very different capabilities. • Fifth: Information required to make investment decisions does not exist. Failure and iterative learning are required. • Sixth: It is not wise to always be a leader or always a follower. Disruptive innovations reward leaders. • Seventh: Small entrant firms enjoy protection because they are doing things that do not make sense to the industry leaders. It is no secret that established companies have major challenges with Innovation. Based on analysis of 750 companies Marla Capozzi and Ari Kellen from McKinsey provide some guidance. Game-changing innovation is a beautiful thing. Disruptive products and services are unleashed. New markets are created. Customers smile, employees cheer and shareholders win. What’s not to like? The problem is that large companies find game-changing innovation staggeringly difficult to achieve. Recently, we analyzed the performance of 750 large companies in the decade before 2008. Apple was the only incumbent in this period to grow by creating new markets repeatedly through disruptive innovation. Our analysis suggests that big companies should focus instead on what we call “innovation at scale” – that is, achieving repeatable and sustainable organic growth from new products, services and business models that build on the core business. This approach, too, is challenging: just 6% of the companies we analyzed managed to innovate at scale consistently through the period. But innovation at scale seems to be within reach of many more companies than might succeed in creating brand new markets. What does it take to innovate at scale? The first element is robust strategy. In our work with clients, we find that companies that innovate at scale have a deep understanding of their assets, capabilities and what makes them successful. They understand at a granular level where growth came from in the past and where it is likely to come from in future. Aspiring to double revenues by 2020 may be a terrific stretch goal, but it is not a strategy. Robust strategy is important because it creates the framing and focus needed to drive greater innovation. Ask people simply to “innovate” and the likely response is a mishmash of ideas. Focus, which can come in the form of simple guard rails, provides the crucial guidance on what really matters to the company’s future success and what types of innovation are required. These factors allow people to experiment and take more risks. Innovation cannot be a side show. Companies that integrate innovation into strategic planning, budgeting and resource allocation are six times more likely to achieve desired financial targets. Leadership, especially in the C-suite, is closely correlated with innovation outcomes. Stay “open” longer. 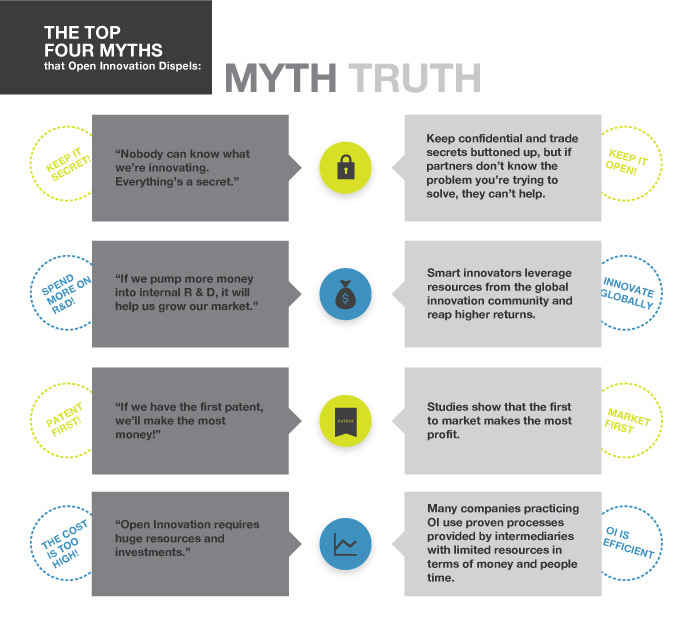 Many companies now use open innovation principles to harvest ideas from consumers, employees and other stakeholders. But once the idea portfolio is set, the process is often surprisingly insular and linear. War gaming innovations early, and testing across multiple economic scenarios, can provide a market view and help to further refine ideas. Structure to execute. It is hard to find a clear correlation between organizational design – that is, use of innovation centers, incubators and labs – and successful innovation at scale. That said, these structures can be helpful ways to bring people together, allocate resources and track progress. Hand-pick talent. Innovation projects staffed by volunteers tend to underperform those run by people selected for the role. This shouldn’t disqualify people who raise their hands for the right reasons (e.g., passionate about the idea, hunger to contribute) but it is a reminder that raw enthusiasm is no substitute for the right expertise and capabilities. These days we can constantly see reports of where Predictive analytics is applied. Need seekers (think Apple): These are companies that actively and directly engage current and potential customers to shape new products and services based on superior end-user understanding, and strive to be the first to market with those new offerings. Market readers (think Samsung): These companies watch their customers and competitors carefully, focusing largely on creating value through incremental change and by capitalizing on proven market trends. Tech drivers (think Google): This category includes companies that follow the direction suggested by their technological capabilities, leveraging their investment in research and development to drive both breakthrough innovation and incremental change, often seeking to solve the unarticulated needs of their customers via new technology. As with companies mentioned above, each of these three strategies can produce superior financial results and there are always individual companies outperform others within each strategic group. The success in each category depends closely to company’s culture and mindset. Wall Street Journal just published its annual list of the top 50 U.S. VC backed Companies. and the track record of its founders and board members. More than 5,900 candidates were considered. It is interesting to see that unlike in years past, none of the companies on this year’s list are in the energy sector. Also this year was also the first time that a health-care company didn’t top the ranking. As described by Henry Chesbrough, a professor and executive director at the Center for Open Innovation at the University of California, Berkeley “Open innovation is a paradigm that assumes that firms can and should use external ideas as well as internal ideas, and internal and external paths to market, as the firms look to advance their technology”.